When working with rotary bits rotating in excess of 15,000 RPM, blue foam that becomes a dangerous particulate when cut, and potentially unpredictable behavior, it is a necessity to integrate safety into every aspect of our product. The Classic E-Stop, this switch disconnects all power to the whole system. This magnetic switch detects when the door is closed, and breaks all power to the motors when its not. Born of a desire to have a hard-mounted stop, this flip switch functions identically to the door switch. This 5 amp breaker trips if the electronics draw more than their expected current. It also functions as an on/off indicator. Blue foam is a hazardous particulate, and as such must have considerations made to reduce the operator's exposure to it. 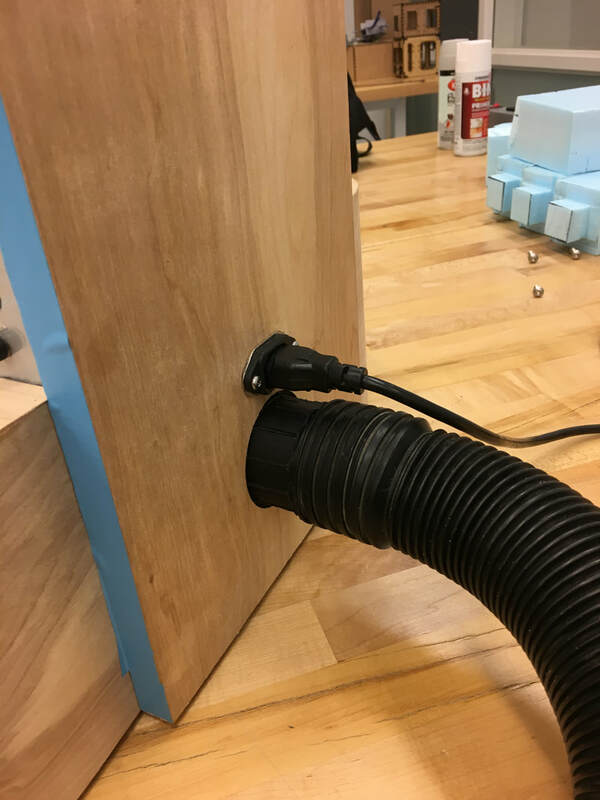 In this project, this comes in the form of a modular shopvac attachment for a portable vacuum. This attachment allows for easy installation, with the vacuum plugging directly into the rear of the product. From there, a custom tube is routed up to the cutting bit, and catches more than 90% of the material generated by machining a shape. By definition, the airflow captures the smallest particles most easily, only missing the chunks large enough to be safe to contact. An important aspect of working with cutting tools, regardless of cutting medium, is protecting the operator and any observers from danger due to a shattering cutting tool. Thus, we designed the housing of Odysseus to incorporate almost 8 square feet of high-strength lexan plexiglass, commonly used to make safety shields in industry. This allows for a 270 degree viewing angle, and showcases the cutter motion through the transparent side of the housing. The first and most catastrophic electronics failure we had caused all three motor controllers, the motor shield, and the Arduino to burn out, and prompted the addition of a ventilation fan to push air across the electronics to facilitate cooling. We later realized that the failure was due to inadequate current regulation, but the fan remained a useful addition. In order to combat the accidental overdraw of any one of our components after our system burned out during the second sprint, we added a main breaker to protect electrical hardware from current overdraw. This, combined with numerous disconnects along the way, and more conservative software, allowed the system to stay safe and efficient.